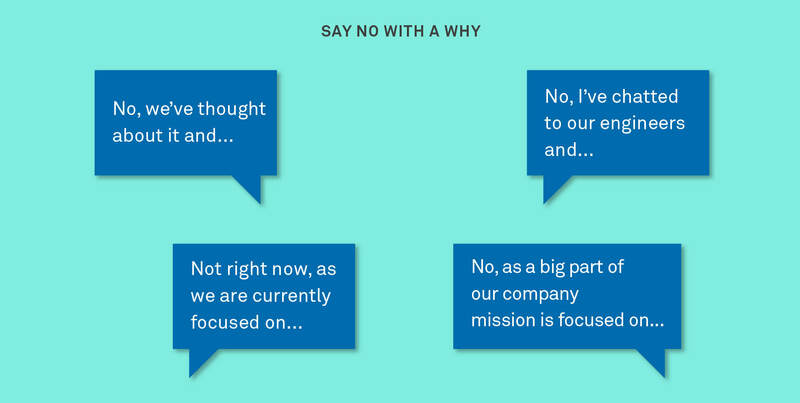 Building a successful product means getting good at saying no. But exactly how do you say it? When you’re on the front line, representing your company’s product decisions, how do you deliver that news successfully? Working as part of our Customer Support team, I’ve experienced first hand just how tricky this can be. Ultimately, the information that you’re about to share is not going to be what the customer wants to hear. However, there are a few key things that can help you make that “no” a bit more palatable for your customers. Like any negative conversation in life, context is key. If you can explain why you’re saying no, it’s an easier pill for your customer to swallow. Without it, customers feel entitled to be angry, upset and disappointed. With context, they can still feel all these things but deep down they’ll know they’re a little less entitled to. A common consolation is the knowledge that something isn’t a mistake, but a deliberate decision. Customers feel frustrated when they believe a sloppy oversight has led to a feature they would love being overlooked. The simple reassurance that this decision is tied to your company’s end goals and is in line with your overall mission can completely change how the news is received. Never underestimate the power of why. A good relationship between support and product teams can really help provide this context and solidify the why. At Intercom, the Customer Support team members will regularly jump into product team Slack channels and run through logic of decisions with engineers to make sure we fully grasp the details of any given decision. Having that open line of communication means you can get that extra sliver of insight and say no with even more detail and confidence. When you’re chatting with customers about how great your product is and how much they love your newest feature it’s easy to be personal and for conversations to be all sunshine and gifs. 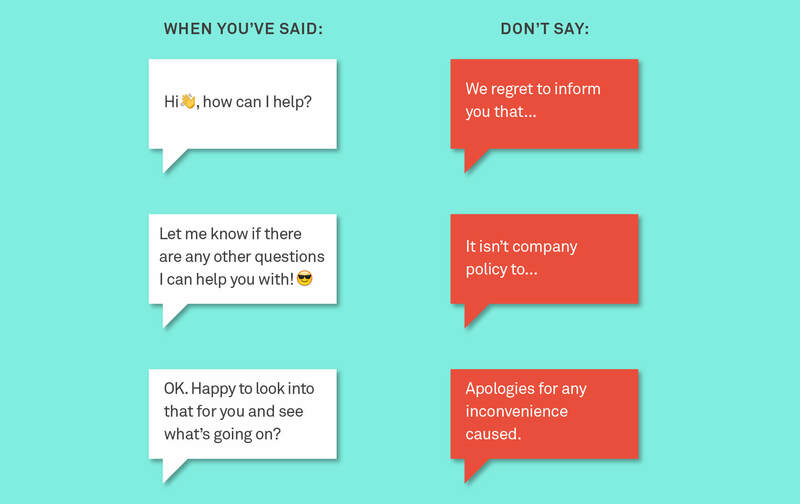 But something I’ve seen happen to lots of my teammates is the second they have to have an awkward or undesirable conversation with a customer, they stiffen up and their language completely changes. When the conversation takes a turn for the worse it’s easy to let all that personality go and default to formal speak. But this is when being personal is most important. People are afraid of conflict and are uncomfortable saying no on behalf of their company, so they become overly formal and in turn, somewhat robotic. From the frustrated customer’s perspective, a stiff “no” reply can be interpreted as you not having any empathy for their situation and simply parroting off a stock company line. Remain friendly and personal when saying no. Resist the urge to hide behind formal language and try to continue to be yourself as much as possible. If in doubt, ask yourself if you’d use the same language to explain the situation to a friend or colleague. If it would feel weird speaking to them that way, then don’t speak that way to your customer. Things go wrong and mistakes happen. Funky and frustrating bugs crop up and customers are negatively affected. We’d all love to have a clear and solid explanation for every issue customers face but the reality is sometimes that just isn’t possible. If, like Intercom, most of your customers are running businesses themselves, appeal to that business sense. Involving the customer in the resolution helps them empathize with you. It also helps you get a fuller picture of the fallout and allows you to appreciate and understand why and how they were affected. 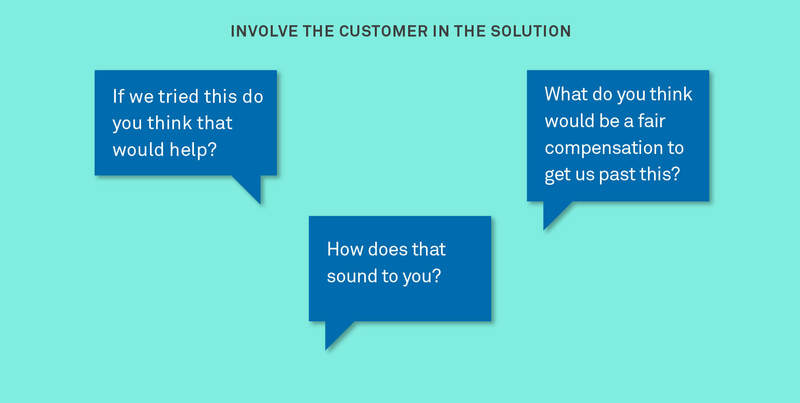 Asking things like, “What do you think would be a fair compensation to get us past this?” or offering a solution and then asking “How does that sound to you?” can really bring the customer into the situation and help them feel empowered in the resolution. Sometimes a hard line has to be taken and you need to push back of course, but when you involve the customer in finding the solution it can be the catalyst for them taking a more pragmatic approach to the entire situation. At Intercom, we really discourage our Customer Support team from simply saying, “You can’t do that at the minute, but we’ll pass it on as a feature request” to our customers. Granted, sometimes that is the response that makes most sense but typically we try and dig a little deeper. 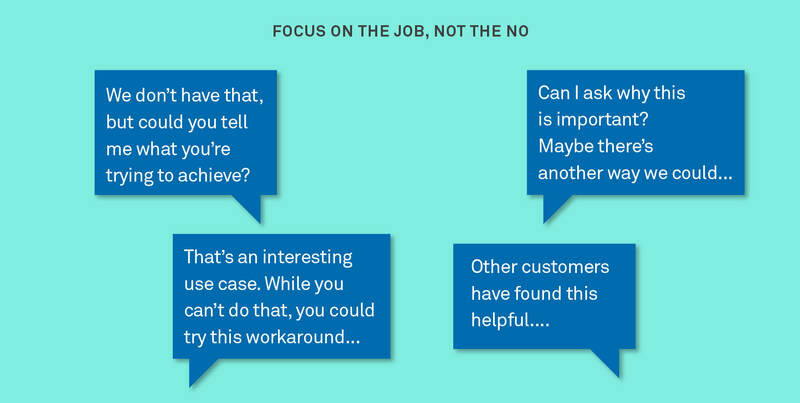 It’s far better to try and move the focus off the feature a customer is asking for and on to what they’re actually trying to achieve. Ask a few more probing questions to find out exactly what their end goal is. Best case scenario, you’ll know a work-around. Worst case scenario, you now have extra context to pass on to your product team. The idea of telling a customer that it’s okay not to continue using your product and to perhaps check out other options instead can be a really tricky thing to get your head around. There are reasons why you built your product the way you did and it would be silly to expect that to align with the needs and wants of every customer and company out there. Nobody wants a frustrated, disillusioned customer who constantly contacts your support team because they’re struggling to use your product in a way that it’s simply not designed to work. At Intercom, if we know a customer is paying us good money we want them to love our product and really feel the value from every penny of their monthly subscription. There will be ups and downs during their lifetime as an Intercom customer, and those things we can get around. However, if what the customer wants to do is something that our product fundamentally is not built to do, then they’re never going to feel happy and satisfied and we’re never going to fully ‘get around’ it. They’re never going to feel they’ve gotten bang for their buck and they’re not going to enjoy using our product. In those cases we’ll be sad to part ways but we’ll definitely suggest it if we know it’s best. Always strive to show empathy to your customers but never to the point that you end up throwing your engineering or product team under the bus. It’s fine to agree that you’d also love to see a certain feature added. But try balancing that with a shout out to some of the cool features that have been recently shipped or improved on. This can help hammer home the deliberate nature of how your team builds and can remind the customer that you didn’t just forget or overlook building the features they’d like, you simply decided that others took priority for now. This is another example of the benefit of having a strong relationship between support and product teams. Being close to your product team, knowing and appreciating what they’re working on, and working hard on, means you prevent your customer support team from developing a biased perspective with one-directional empathy. Being able to say no and say it with confidence is certainly not an easy skill to master. It takes time and practice and even the most seasoned pro will get it wrong from time to time. However, if you have a solid and deep understanding of your company’s core values and can genuinely say that you’re on board with them, the odds of a successful no conversation will be significantly higher.